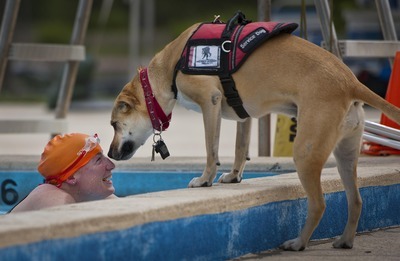 The cost of training an Assistance Dog in Australia can be in excess of $30,000. This sounds like an incredible amount until you think how much it would cost to pay a human to stay with a person with a disability 24/7 doing all sorts of support tasks. Assistance dogs,sometimes called service dogs, can help people with a variety of disabilities. They can support those who have had a developmental disability such as cerebral palsy or spina bifida since birth. They can help people who acquire a disability later in life either through an accident or an illness such as multiple sclerosis. In addition they can provide help to those who suffer from Post Traumatic Stress Disorder, autism, dementia or other conditions. Service dogs are being provided to people with an increasing range of disabilities. 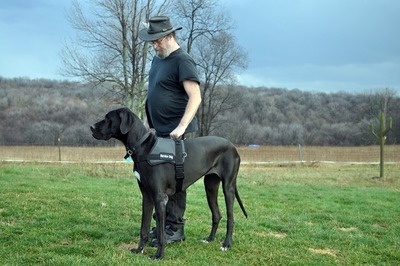 The type of support provided by the dog depends on the individual's disability and what support they require. The idea of an assistance dog is that it will increase the independence of the person it was trained to help, not do tasks the person is capable of doing. In Australia Labradors and golden retrievers are often trained as assistance dogs due to their temperament. They are known for being kind, intelligent and sensitive. Australian law (through the Disability Discrimination Act 1992, amended in 2009) guarantees that people who have a disability and have been provided with an assistance dog will be able to take that dog on public transport and into cafes, restaurants, accommodation, entertainment venues and hospitals. Some people with a disability are able to live independently because of their assistance dog. Without their dog they would need to live in accommodation where human support was available 24/7. They would need a human to accompany them on outings and they would have to fit in with the availability of that person.